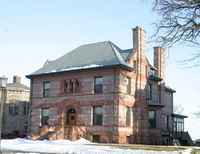 Lightner, who had outgrown or grown tired of his house at 322 Summit Avenue, hired Gilbert to design a house next door at 318 Summit Avenue. 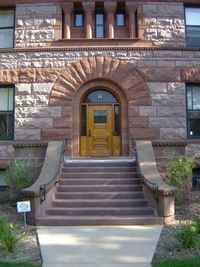 The design is the most Richardsonian of all Gilbert's residential efforts and one of the most poetic. Its great success is the integration of every element of the facade into the whole. The scale, balance, and surface textures of the composition all contribute to the effect. Here, purple Sioux quartzite is banded with Kettle River sandstone. The detailing—including the brick pattern-work under the eaves, layered masonry and moldings, and bands of windows between columns—is exquisite. 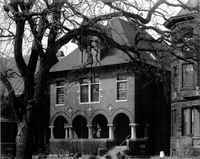 Gilbert mixed and matched wood-muntin windows with leaded-glass windows as he had done in the Lightner-Young House. 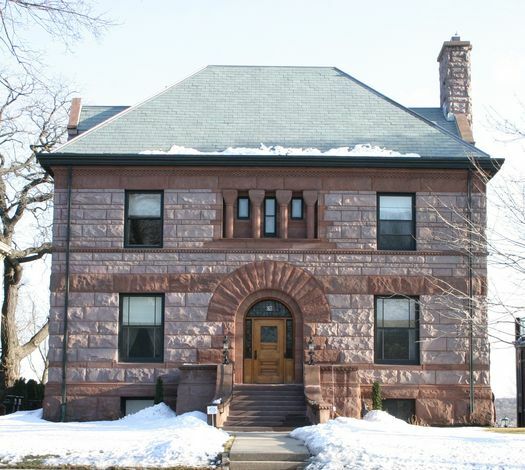 Interiors are strongly Richardsonian with grand fireplaces, mahogany paneling, leaded-glass lights and doors between rooms, and built-in storage units.